Duck done wrong: greasy, fatty, tough meat, no flavor. Duck done right: crisp skin, melt in your mouth tender meat, flavor you wouldn’t believe. 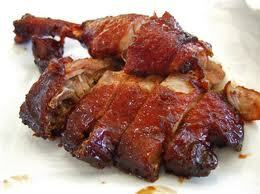 Personally, I like to roast the duck whole, and season it with the wonderful palette of south east Asia. Follow this recipe, you will also love duck until the end of time. Or you can break the duck down, confit or braise the legs, sear the magret (duck breast) and create more work for yourself. What you have to remember about duck, is that it is a water bird (game bird). Therefore it has an incredible layer of fat covering the meat, and the meat tends to be much darker and gamier than something more run-of-mill, like chicken. Duck breast does not need to be cooked all the way through. Top restaurants prefer serving duck breast medium as opposed to well done. The same roasting rules apply (see my roast chicken entry) but the marinade process is a little different. I put MUCH more intense flavors into my duck. Also, regarding gaminess, its flavor profile is similar to turkey. Wash and dry the duck thoroughly. Using a fork, put many holes in the duck skin (this allows the marinade to get inside, and later, helps render the fat out). Lightly coat the inside and out with 5 spice. In a mixing bowl, combine all other ingredients except chicken stock, salt and pepper. Put the duck in a ziplock bag, add the marinade to the bag, seal tightly, and refrigerate over night. Heat oven to 425 degrees. Remove duck from marinade and reserve the marinade. Pat duck dry and reapply 5 spice. Liberally salt and pepper duck, truss (youtube to learn how) and place on a perforated roasting pan, center rack in the oven. Begin roasting. While the duck is roasting, begin reducing the marinade and the chicken stock in a sauce pot (when it becomes very thick, turn heat off and stop reducing). Every 20 min, ladle a small amount of the marinade over the roasting duck. When the duck is deeply browned, turn the heat down to 250 and continue to roast for about 2 hours, or until cooked through, applying marinade (glazing) every 30 min. Return heat to 400 for the last 30 minutes and glaze with the remainder of the marinade. The skin should be deep golden brown and slightly redish when done. Serve this with potatoes cooked in olive oil and soy sauce, steamed jasmine rice, fried rice, ginger and garlic broccoli, baby bok choy, sesame carrots, lomein noodles, or whatever else you want. I try to stick with Chinese sides, but Thai, Vietnamese, and oddly enough, French sides work equally enough.